of two tidally locked objects orbiting the Sun from afar. The system: 2010 WG9 may likely look like this. What if we could journey to the outer edge of the Solar System - beyond the familiar rocky planets and the gas giants, past the orbits of asteroids and comets - one thousand times further still - to the spherical shell of icy particles that enshrouds the Solar System. This shell, more commonly known as the Oort cloud, is believed to be a remnant of the early Solar System. Imagine what astronomers could learn about the early Solar System by sending a probe to the Oort cloud! Unfortunately 1-2 light years is more than a little beyond our reach. But we’re not entirely out of luck. 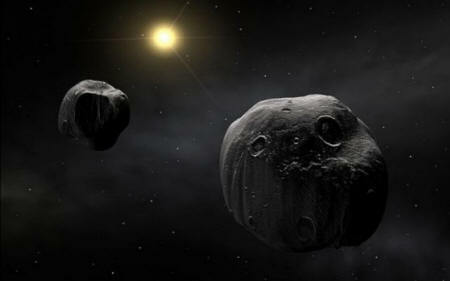 2010 WG9 - a trans-Neptunian object - is actually an Oort Cloud object in disguise. It has been kicked out of its orbit, and is heading closer towards us so we can get an unprecedented look. But it gets even better! 2010 WG9 won’t get close to the Sun, meaning that its icy surface will remain well-preserved. Now you might be thinking: wait, don’t comets come from the Oort Cloud? It’s true; most comets were pulled out of the Oort cloud by a gravitational disturbance. But observing comets is extremely difficult, as they are surrounded by bright clouds of dust and gas. They also come much closer to the Sun, meaning that their ices evaporate and their original surface is not preserved. So while there is a surprisingly high number of Oort cloud objects hanging out within the inner solar system, we needed to find one that is easy to observe and whose surface is well preserved. 2010 WG9 is just the object for the job! It is not covered by dust or gas, and is believed to have spent most of its lifetime at distances greater than 1000 AU. In fact, it will never approach closer than Uranus. Astronomers observed 2010 WG9 with four filters: B, V, R, and I, also known as blue, visible, red, and infrared wavelengths. What did they see? Variation - a change in color over the course of just days. The dwarf planet Pluto has patches of methane ice, which also show up as color variations on its surface. Unlike Pluto, 2010 WG9 is small (100 m in diameter) and cannot hold on to its methane ice. It’s possible that part of the surface is newly exposed after an impact. According to Rabinowitz, astronomers are still unsure what the color variations mean. Rabinowitz was very keen to explain that 2010 WG9 has an unusually slow rotation. Most trans-Neptunian objects rotate every few hours. 2010 WG9 rotates on the order of 11 days! The best reason for this discrepancy is that it exists in a binary system. If 2010 WG9 is tidally locked to another body - meaning that the spin of each body is locked to the rate of rotation - then 2010 WG9 will be slowed down in its rotation. According to Rabinowitz, the next step will be to observe 2010 WG9 with larger telescopes - perhaps the Hubble Space Telescope - in order to better measure the color variation. We may even be able to determine if this object is in a binary system after all, and observe the secondary object as well. Any future observations will help us further understand the Oort cloud.